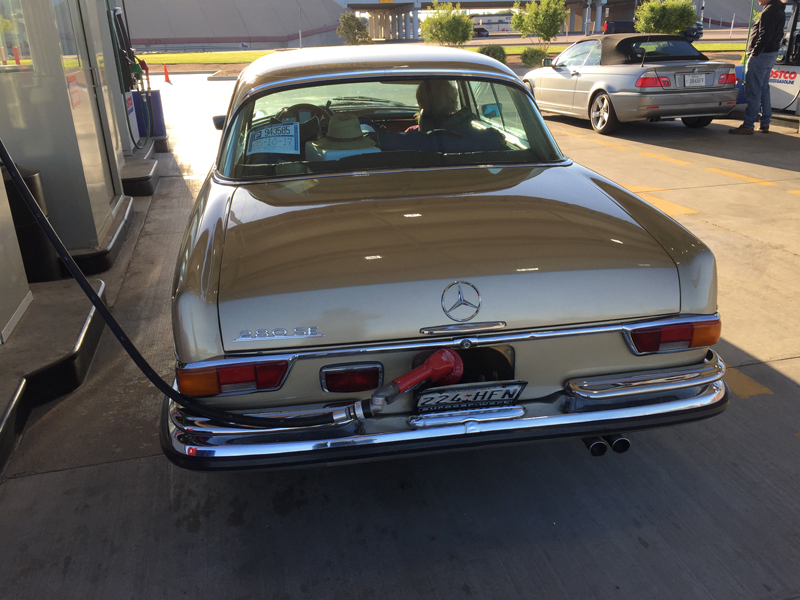 Two mandatory stops are required before we leave Lubbock; coffee for Testa Rossa, and gasoline for the Coupe. When I lived in Lubbock I spent every moment of my free time either out of Lubbock, or getting out of Lubbock. 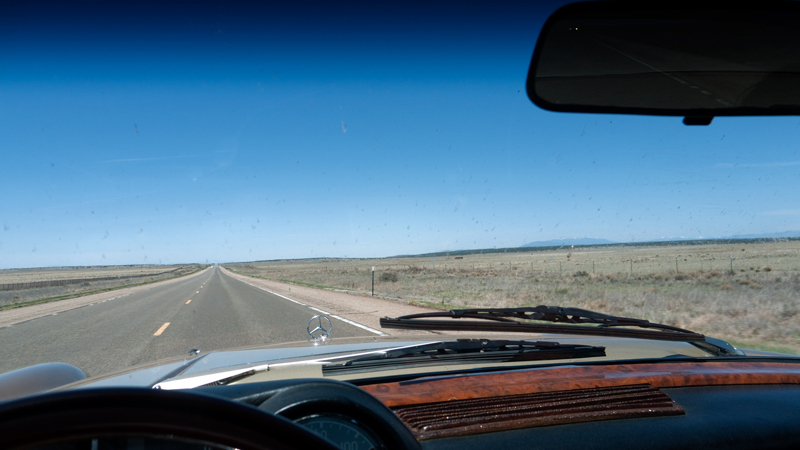 I usually was headed west or northwest, towards the Rocky Mountains of New Mexico and Colorado. Skiing in the winter & spring, as well as climbing all year round. One of my enduring memories from my time in Lubbock was walking out to an empty area of the Tech campus, and watching the western sky at, and most importantly after sunset. 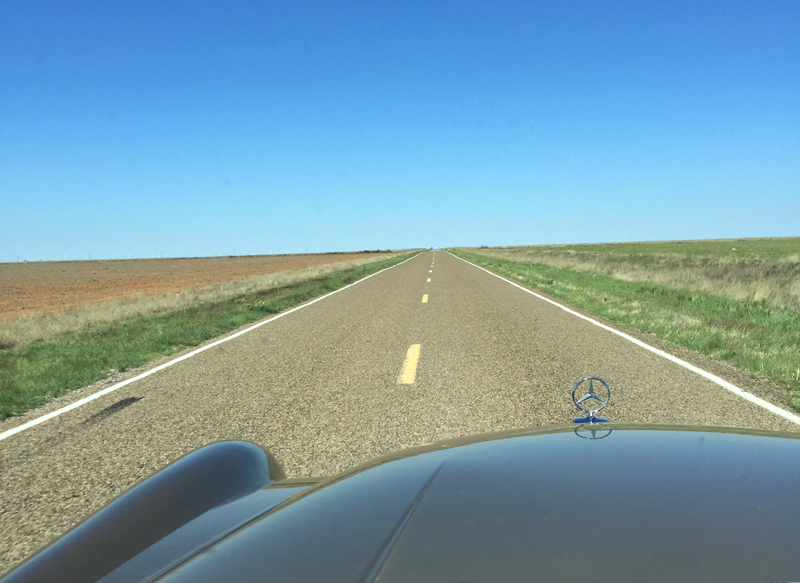 About 265 miles due west of Lubbock are the closest mountains. Due to the curvature of the earth, they were invisible at that distance, but due to their over 12,000 foot altitude, they would – under certain atmospheric conditions – cast shadows upwards onto the sky that were visible for a few minutes after the sun sank below the horizon beyond them. Much like the “green flash” that people watch for at sunsets over oceans, the mountain shadow was something that brought me comfort during my time in The Unbearable Flatness of Being in Lubbock. I’ve driven just about every road in eastern New Mexico on my various travels to and from the mountains, but I was able to find a route for a portion that I’d never driven before, Highway 114. I combined it with NM 330/267, then onto the familiar routes of US 60, I-40, & US 285 to Santa Fe to round out our day. As soon as we cross the border, the road loses its paved shoulders, narrows dramatically, and the surface appears to be worn, neglected asphalt. This is the way New Mexico have always been. I recall a very rural highway in New Mexico I used to drive often in my college years whose speed limit signs had never been updated, even a decade after the national 55 MPH speed limit was enacted. It still had sections posted for 60 and 65 MPH. 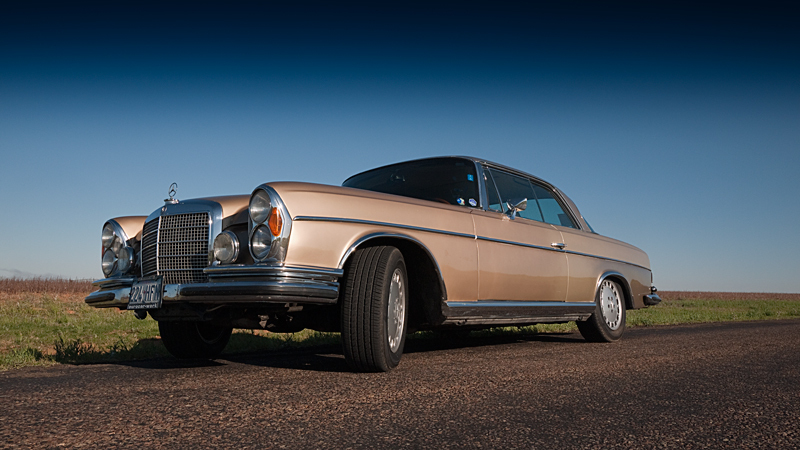 I was driving a naturally aspirated Diesel car back then with a whopping 45 horsepower, but you can be assured I would wind that thing all the way up and push it to 65 MPH gleefully. Diesel fuel cost about 59¢ a gallon back then and I could drive from Lubbock to Denver for about $5. Ah.. memories. Today however, the 55 MPH limit applies on New Mexico Highway 114. Given the wavy, poor-quality asphalt I have no problem adhering to the law today. "It ain't art until there's a windmill innit." 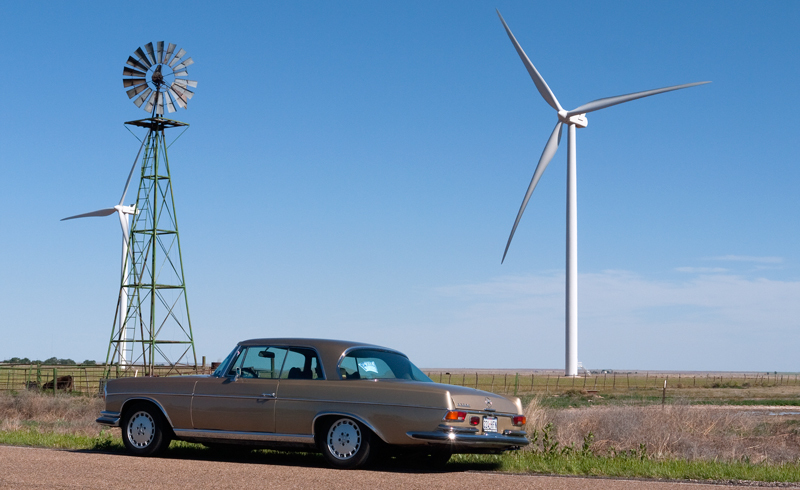 I’m actually quite happy to see these large wind turbines all over the South Plains. It makes so much sense to harvest this near endless energy source for the production of electricity. 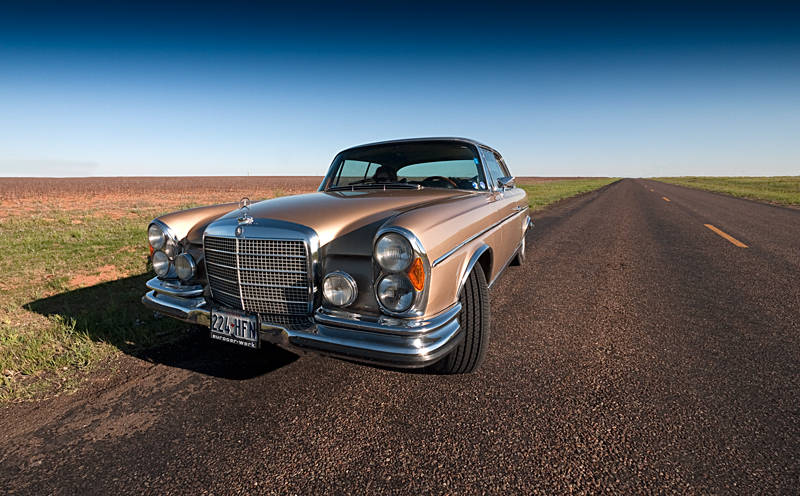 Our route zig-zags north and west through Elida, Melrose, to Fort Sumner along the Pecos River, then to Santa Rosa on Interstate 40, which is the modern replacement for the old Route 66. Along this stretch is where the Rocky Mountains come into view. I have a nose for snow. I never fail to spot a snow covered mountain as it comes over the horizon, and point them out to Testa Rossa, who at first insists they are clouds. But as we get closer they resolve into what I know they are, mountains! From here all the way home we will have mountains with us the entire time. Taking US Highway 285 into Santa Fe I glance down to the dashboard and see that the reserve light is on for our fuel status. Not sure how long it has been on, I’m taken by surprise. I take the first exit into the city and start seeking a gas station. Of course there are none to be found! We resort to using technology, and find a station a mile or so away. I fill up the car and, if I assume the car has a 20-gallon tank, figure that we had about a pint left. I kick myself and make a mental note to avoid this situation in the future. We find our hotel, and Testa Rossa zips off to the nearby Georgia O’Keefe Museum while I stay behind and do some work. Later, she meets with a family friend for drinks at the hotel bar. We’re both feeling a little ill from our lunch, and miss out on the joy of New Mexican Cuisine. I can’t even finish my margarita, and head back to the room and hit the sack. Liked the caption under the first photo. How many times have any of us done that – but we are usually in or near a city. You were lucky. I did a long road trip from SoCal to Aspen, and then back in winter 1989. Went through Monument Valley early in the morning sun after a nighttime snowfall. Pictures are scanned but not yet up on Flickr. 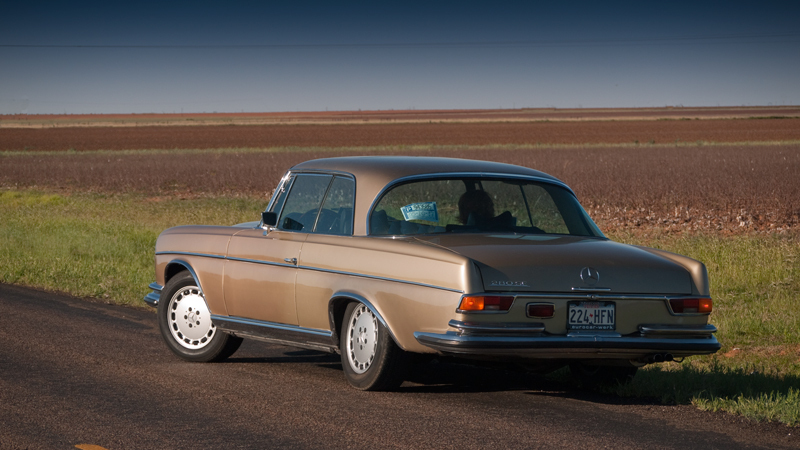 Previous Previous post: Texas to Oregon in a classic Mercedes 280se Coupe: Day 2, Comanche, to Lubbock, Texas.